So, the Illini are bowl eligible. Something that was deemed unthinkable a month ago came to fruition this past Saturday, as the Fighting Illini defeated the Northwestern Wildcats 47-33 to not only get their elusive sixth win of the season, but also take back the Land Of Lincoln trophy that has been residing in Evanston for the past two seasons. More importantly, however, it evidently bought head coach Tim Beckman at least another season in Champaign. In a statement on Sunday afternoon, Illinois athletic director Mike Thomas announced that Beckman would be back for a fourth season, ending speculation that he would be gone at the end of the 2014 season. Whether or not this turns out to be a good idea in the long run, the mere fact that the Illini reached the six win mark and bowl eligibility seemed to be enough. True, at times it looked as if Beckman would not return in 2015, but Thomas wanted progress, and going from 4 to 6 wins showed him all he needed. With starting quarterback Wes Lunt still not 100% from his fractured fibula injury sustained earlier in the season, the onus fell upon senior Reilly O'Toole to shoulder the load and lead the team to victory. And lead is what he did, completing 17 of 28 pass attempts for 147 yards and throwing three touchdown passes. Freshman sensation Mikey Dudek, who is nearing 1,000 yards receiving for his inaugural year, caught 7 passes for 63 yards and one of those scores. Fellow freshman Malik Turner caught his first career touchdown, and senior Martize Barr caught O'Toole's other offering. Tailback Josh Ferguson found the endzone twice, and Mason Monheim returned an interception 49 yards for a score. Illinois improves to 6-6 overall and 3-5 in the Big Ten with the win, and will now get some extra practice time, which Beckman thinks will benefit his team greatly. So, what does this all mean? No destination has been announced as of yet, but two possible places that the Illini could land are either in Dallas or Detroit. The Big Ten has bowl ties with 10 bowl games, so it seems that all the teams eligible should get one of the conference tie-ins. So, it really depends on a couple factors, the main one being how a team will travel. Judging by the way attendance was at the final home game this season, the Illini contingent will not be a large one since morale is at a level that hasn't been seen in a long time. Hopefully a bowl win will change the mood. Things have started out very well for John Groce's Fighting Illini mens' basketball team, as they have been one of the highest scoring teams in the nation through the first two weeks of the season. The Illini captured the championship of the Continental Tire Las Vegas Invitational this past weekend with wins over Indiana State and Baylor. The Illini played their first true road game on Tuesday evening at Miami (Florida) in the annual Big 10/ACC Challenge, and suffered their first setback of the young season 70-61 to the #15 ranked Hurricanes. The Illini entered the national rankings themselves for the first time on Sunday, coming in at #24, but most lilkely will fall back out when the new polls are released at the end of the coming week. Senior Rayvonte Rice scored 22 points and notched a double-double with 12 rebounds. Malcolm Hill continued his early season success by scoring 13 points, the only other Illini player to record double figures. The Illini fell behind on several different occasions, but found a way to come back most every time. The problem was that Miami had an answer for every Illinois comeback, and proved to be too much down the stretch when the game was in the balance. The Illini fall to 6-1 on the season,. while the Hurricanes improve to 8-0 with the win. The Illini return to action on Saturday afternoon when they welcome the Eagles of American University to the State Farm Center. Game time with American on Saturday is set for 1:00 pm central time and will not be televised. Matt Bollant's Fighting Illini women's basketball team is also off to a good start early in the 2014-15 season, and already have one signature win to their potential NCAA Tournament resume. The Illini defeated #9 Kentucky 77-71 in the opening round of the Paradise Jam Tournament in the Virgin Islands to continue momentum from the first few games of the season. However, that mementum was short-lived, as the Illini dropped a pair of games in the remainder of the tourney, losing to South Florida 67-61 and then falling to Oklahoma 78-76 in overtime. Bollant has welcomed early season huge numbers from his freshman McDonald's All-American, Chatrice White, who is playing really well. In the loss to the Sooners, Ivory Crawford scored 27 points to lead the Illini, but it wasn't enough to secure the win. The Illini return home on Wednesday night to take on the Virginia Cavaliers in the women's version of the Big 10/ACC Challenge at the State Farm Center. The Illini enter play with Virginia at 5-2, while the Cavaliers come in at 5-1 overall. The game, which is scheduled to begin at 7:00 pm central time, will not be televised, but will be available on the BTN Plus platform for a nominal fee. Kevin Hambly's Illinois volleyball team completed a very successful regular season with a 3-1 victory over Michigan this past Saturday evening at Huff Hall. Illinois was paced by Katie Stadick, who hit .444 with 8 kills and 9 blocks and Jocelynn Birks led both squads with 16 kills. With the victory, the Illini seal up third place in the Big Ten standings with an overall mark of 24-7 and 16-4 in conference play. On Sunday evening, the Illini learned their fate in the upcoming NCAA Tournament, where they were named the #9 overall seed. The Illini will host the first and second rounds this weekend at Huff Hall, the 16th time they have hosted and the fifth time under Hambly. Illinois will face Murray State (26-5, 14-2 in the OVC) on Friday evening at 7:00 pm, with Iowa State and Western Kentucky facing off in the other game right before the Illini match. The winners will face each other on Saturday evening for the right to advance to the Sweet 16. The task ahead of the Fighting Illini football team couldn't be more clear. Win out, or go home. The Illini were defeated 30-14 last Saturday by the Iowa Hawkeyes, a team they hadn't seen on the field since 2008. Quarterback Wes Lunt returned under center for Illinois, and was a little rusty on offense, completing 14 of 25 passes for 102 yards and a touchdown to freshman sensation Mikey Dudek. Dudek, who is havng a fantastic freshman season, hauled in 8 balls for 60 yards and 2 touchdown catches, the other one coming from backup QB Reilly O'Toole late in the fourth quarter. The Illini have put themselves in a precarious position, needing 2 wins in the final two games in order to become bowl eligible and save head coach Tim Beckman's job. Beckman has been under scrutiny this season, having won just 2 conference games in his three seasons in Champaign. However, Beckman maintains that the team is on the right path, and claims to be getting better each week, although the overall record does not reflect that. The Illini are 4-6 overall, but just 1-5 in Big Ten play, and whereas the possibility still exists about getting a bowl bid, the reality speaks otherwise. The first step in that process will be this coming Saturday, when the Illini welcome Penn State to Memorial Stadum for Senior Day (11:00 am CT, ESPN2). The Nittany Lions come into the game with Illinois at 6-4 overall and 2-4 in the tough East Division of the Big Ten. The Nittany Lions stepped out of conference last Saturday and defeated Temple 30-13 in State College. Penn State has one of the more talented quarterbacks in the league in Christian Hackenberg, although his numbers in the win over the Owls didn't show it. Hackenberg completed 12 of 26 passes for 112 yards, and threw two interceptions on the day. The story of the game for Penn State was the running of Akeel Lynch, who carried the ball 18 times for 130 yards and a touchdown. The Illini have been known to be soft against the run, and the running of both Lynch and Bill Belton could prove fatal for the Illini defense. One of the best things about this time of year is the crossover of the sports seasons. Since volleyball and soccer are beginning to wrap up, mens' and womens' basketball is just beginning in the currently renovated State Farm Center. John Groce's mens' team opened up the season last Friday night in rather uneventful fashion, defeating Georgia Southern 81-70. Knowing Groce wasn't too happy with the effort against the Eagles, the Illini came out on Sunday a completely different focused team, taking down another flock of Eagles, these from Coppin State 114-56, as six players scored in double figures for the Fighting Illini. Leading the way for the Illini were freshman Leron Black and Ahmad Starks, who each scored 18 points. Aaron Cosby added 17, while senior Rayvonte Rice chipped in 14 for Illinois, who improves to 2-0 on the young season. The Illini tied a State Farm Center record by draining 15 three-pointers, and came within one of the all-time high for a single game of 16, set during the impeccable game against Arizona back in 2005. The Illini will be back in action this coming Friday night when they welcome the Governors of Austin Peay to Champaign. If the name Austin Peay sounds familiar, it should. Those Illini fans that have been around a while will remember the crushing loss that Illinois suffered to the Governors in the 1987 NCAA Tournament. Hopefully, the news will be happier this time around for the Illini faithful. Matt Bollant's women's team has also started their season, and are off to a quick 2-0 start, despite missing all 21 of their three-point attempts in the season opening, come-from-behind win over IPFW. The Illini fared much better in their second game, a 66-48 win over Robert Morris at the State Farm Center on Tuesday night. In that win, freshman sensation Chatrice White, a McDonald's All-American in high school, led the Illini in scoring with 23 points and grabbbed 8 rebounds, while senior Brittany Carter recorded a double-double, scoring 11 points and caroming 10 boards. The Illini will be right back in action on Thursday night against Memphis (7:00 pm CT, No TV) and then again on Sunday when they host Southern University (2:00 pm CT, No TV). The regular season is coming to a close for Kevin Hambly's Illini women's volleyball team, and they have a huge match coming up on Wednesday evening. The #10 ranked Illini will travel to Madison, Wisconsin to battle the #2 Wisconsin Badgers in a pivotal top-ten matchup (7:00 pm CT, No TV). The Badgers come into the match with the Illini at 24-2 overall and 15-1 in conference play, while the Illini check in at 21-6 overall and 13-3 in the Big Ten. The Illini will also wrap up the road games for the regular season on Saturday, when they travel to Bloomington, Indiana to battle the Indiana Hoosiers (6:00 pm CT, No TV). Yes, the unthinkable happened last weekend at Memorial Stadium in Champaign, and what I mean by that is the Illini finally won a home Big Ten game with Tim Beckman as head coach. The Illini defeated the Minnesota Golden Gophers 28-24 Whatever the fate of Beckman is at the end of this season, one thing remains clear: this team keeps trying, and win or lose, the effort is there. Three things can be taken away from the game on Saturday that led to the win. The first one is the play of Reilly O'Toole. Although O'Toole didn't have stellar numbers (14-21-0 for 118 yards and one touchdown), he did employ the run a little more than he normally does. This is normally reserved for O'Toole's main competitor, Aaron Bailey, who saw just one series of action during the game. Beckman had said earlier in the week that both quarterbacks would see action, but when Bailey came into the game, the offense wasn't flowing the way he wanted it to, so he went back to O'Toole, who finished the game. O'Toole gained 59 yards on 17 carries, and scored another touchdown via the run, getting his first win as starting quarterback. Another thing that can be taken away from the game on Saturday is the play of the defense. Under Tim Banks, the defense has performed miserably so far this season, but against the Golden Gophers, they bent but didn't break. When the Illini had a lead, they maintained it for the most part, but once again had to hang on for the victory. Which brings me to my third thing from last week, which is the stellar play of cornerback V'Angelo Bentley. Bentley has been a one-man wrecking crew on special teams and defense, and his scoop of a recovered fumble that essentially won the game also put him in the record book at Illinois. Since Bentley arrived in Champaign, he has now scored a touchdown four different ways, running a kickoff back, taking a punt back, getting an interception and returning it for a score, and now, picking up a fumble and scoring. Not even Red Grange, whom the Illini honored by wearing grey uniforms last Saturday, can claim that. So, what can the Illini do for an encore this week? First of all, their matchup is a very tough one, as they head east to Columbus, Ohio to battle the Ohio State Buckeyes in prime time (7:00 pm CT, ABC). The Illini haven't won in Columbus since 2007, which coincidentally, was when Juice Williams was the quarterback. Williams is now on the coaching staff, so he can get in the heads of the players and instill them on how to beat the Buckeyes. Ohio State had an injury to their signal caller earlier this season, as Braxton Miller suffered a season ending injury. Enter J. T. Barrett, who may even be better than what Miller is. Illinois (4-4, 1-3) heads into the Ohio State game with some sustained momentum following the win over Minnesota, but the Buckeyes will be waiting. Ohio State (6-1, 3-0) needed double overtime to defeat Penn State in State College, Pennsylvania, so they will be looking to make a better showing when they face the Illini. Barrett's numbers weren't that good against the Nittany Lions, only completing 12 of 19 passes for 74 yards. However, Barrett scored twice on the ground in overtime to seal the win for the Buckeyes. Barrett was also injured in the game, but fully expects to play against Illinois on Saturday night. The Fighting Illini women's volleyball team continued their winning ways last weekend, as they swept a pair of home matches against both Indiana and Purdue at Huff Hall. On Friday evening, the Illini dispatched the Hoosiers 3-0 (25-18, 25-14, 25-19), and then came back on Saturday night to take down the #13 Boilermakers 3-1 (25-20, 26-24, 26-28, 26-24) in a thrilling match. The Illini have now won five consecutive matches and have improved their overall record to 16-5 overall and 8-2 in the Big Ten. The Illini, who come in this week ranked #10 in the AVCA poll, hit the road for the first of three matches in a span of 6 days. On Friday night, the Illini head to East Lansing, Michigan to battle the Michigan State Spartans (6:00 pm CT, BTN), and then will travel to Ann Arbor on Saturday night to face the Michigan Wolverines (6:30 pm CT, No TV). The Fighting Illini women's soccer team is wrapping up the regular season schedule, and the up and down season continued this past weekend, when they split two matches at the Illinois Soccer Stadium. The Illini defeated Michigan State on Friday night 2-0, and then were defeated by Michigan on Sunday afternoon 2-1. The Illini will send their seniors out on style Friday evening when they welcome #11 Wisconsin to Champaign for Senior Night. Illinois will recognize two seniors, Megan Green and Noelle Leary, before the match on Friday night. The Illini are currently 10-7-1 overall, but just 5-6-1 in conference play. However, the Illini have earned a spot in next week's Big Ten Tournament, which is scheduled to begin on Wednesday, November 5th in West Lafayette, Indiana. As Fighting Illini men's and women's basketball season approaches, some news off the court (sort of) happened this week. On Tuesday, a storm drain was blocked, resulting in rain water flooding the State Farm Center floor and covering the basketball court. The floor may need to be replaced, but it should not affect the schedule of games this season. Something that will affect the schedule for the beginning of the 2015-16 season is the continued renovation efforts at the State Farm Center. As a result, the first five games scheduled for November 2015 have officially been moved to the Prairie Capital Convention Center in Springfield. The capacity of the PCCC is about half the size of the SFC, but the move is necessary to facilitate efforts to get that phase of the construction schedule completed. More information on this as time goes on. Sometimes the easiest decisions are the most difficult to make. Faced with the fact that their starting quarterback, Wes Lunt, is sidelined with a fractured fibula, the Fighting Illini have turned to a tandem quarterbacking system for this week's Homecoming game against Minnesota (11:00 am CT, ESPNU). However, all of the coaches do not necessarily agree with the decision. As the Illini come off of their first bye week of the season, head coach Tim Beckman is willing to try just about anything to get his team a win and in the process, possibly saving his job by season's end. In this, his third season at the helm in Champaign, Beckman has managed to win only one Big Ten game in 19 tries. Beckman used the bye week to give his players a much needed break, and also to heal up some of the bumps and bruises that have been plaguing his team so far this season. The best reason for the bye was that Illinois couldn't lose this past week, since they didn't play. Harsh, I know, but the facts are nonetheless facts, and this is not a good team right now and without Lunt, it remains to be seen just how good they really are. Reilly O'Toole is the senior and the veteran, but does he have what it takes to lead Illinois to a victory? Aaron Bailey is the more mobile of the two quarterbacks, and his performance against Wisconsin two weeks ago gave Illini fans hope that maybe, if pressed into the same situation this week from a starting perspective, that he could possibly be the one. Lunt will probably miss the next two games, and then there is another bye week in there, so the earliest that he could return to action would be November 15th, when Illinois faces Iowa. Who knows what the situation will be come that time, but if the Illini are still searching for a win when the Hawkeyes come to town, then the question begs do you even bother bringing Lunt back at that point? Illinois volleyball is on a roll as of late, having reeled off three straight match wins, two of those being against nationally ranked opponents. Having defeated #5 Penn State in State College, the Illini had a mid-week contest at Iowa, and came away with a 3-2 win. Then, the Illini went into Lincoln on Saturday night and took down the #13 Cornhuskers 3-1. Having defeated both Penn State and Nebraska, two perennial powers in women's college volleyball, on the road in the same season, is something that just doesn't happen very often at all. The Illini, ranked #10 in the latest AVCA poll, will return home to Huff Hall this weekend to battle Indiana on Friday night (7:00 pm CT, No TV) and then #13 Purdue on Saturday evening (5:00 pm CT, BTN). The Illini are currently 14-5 overall and 6-2 in the Big Ten heading into this weekend's matches. The Fighting Illini women's soccer team has hit the wall lately, where in their last five games, they have managed to lose four of them and get one tie. This past weekend, the Illini traveled east to battle the two newest conference foes, Rutgers and Maryland. On Friday, the Illini lost 2-1 to the #14 Scarlet Knights, but came back on Sunday to tie Maryland 1-1 in double overtime. Coach Janet Rayfield knows that tying a match isn't a big deal to many, but to her squad, it could be just what they need to get into postseason play. "We might need that extra point that we received for the tie, and if it comes down to us getting in the Big Ten Tournament by a point, we will look back at this as a positive", Rayfield said of the tie with Maryland. The Illini are currently 9-6-1 overall and 4-5-1 in conference play, and welcome Michigan State to Champaign Friday night (7:00 pm CT, No TV) and Michigan on Sunday afternoon (1:00 pm CT, No TV). Finally, it would be remiss if I failed to mention the fact that Wayne McClain's passing last week took me by surprise, much as it did everyone else, including his family. Having covered Illinois basketball through the Bill Self and Bruce Weber regimes, I got to know Wayne fairly well. The kind words that have been conveyed over the past few days I can totally relate to, and you will not meet a more genuine man than Wayne was. Godspeed Wayne! We kind of saw this one coming. The Fighting Illini football team began Big Ten Conference play this past weekend in Lincoln, Nebraska, and the result was pretty much what everyone expected. However, there were some late developments that made the outcome even more of a given. On Saturday afternoon, word began circulating that quarterback Wes Lunt might not play, due to an injury that he sustained in the game against Texas State. Lunt did not appear on the team's injury report that was issued on Thursday of game week, which is not a big deal, since the coaching staff doesn't have to list everyone on the report. Lunt was dealing with this injury all week, and didn't practice on Wednesday, which the media wouldn't have known about anyway, since we are not allowed to watch practice. So, enter Reilly O'Toole into the role of starting quarterback in a hostile environment at Nebraska. If Lunt would have played, he might have been injured worse because those defenders really gave O'Toole a rough time. For the game, Reilly was 17 for 38 passing for 261 yards, but threw three interceptions and one touchdown. Josh Ferguson got the Illini going early with a nice 41 yard touchdown run that was actually a backward lateral. What was more impressive about this score was the fact that it answered the Cornhuskers' opening score, a 12 yard scamper by Ameer Abdullah. Abdullah carried the ball 22 times for 208 yards and three touchdowns, and probably could have had close to 400 yards if he would have played the whole game. Nebraska head coach Bo Pelini decided to rest Abdullah for the remainder of the game, and gave some of his carries to Amani Cross, who also carried the ball 22 times for 109 yards and a score. The Illini have a major issue with containing teams that run the football, and this game was very evident of that. The Illini couldn't stop anything, and even Nebraska's quarterback Tommy Armstrong Jr. threw for 166 yards on 10 for 21 passing. Armstrong didn't complete a pass in the first quarter, and as a matter of fact, his first pass was a 63 yard touchdown pass to Kenny Bell. A game like this exposes all of the flaws that a struggling team has, and several of them were brought to the forefront on Saturday for the Illini. The best remedy for a loss like the one the Illini sustained at Nebraska is to just forget about it and move on to the next game. Luckily for Illinois, that next game is back at Memorial Stadium in Champaign, and is against the Purdue Boilermakers (11:00 am CT, ESPN2), who just happen to be the only team that Tim Beckman has beaten in his three year tenure at Illinois. Purdue, who comes into the game with the Illini at 2-3 overall and 0-1 in the Big Ten, lost their conference opener last Saturday at home against Iowa 24-10, has a similar story as the Illini do. Boilermakers coach Darrell Hazell is in his second season at the helm in West Lafayette, and struggled in his first season in the league last season, much like Beckman did in his first season in 2012. The Boilermakers struggle to score much like the Illini do, and do not have an air tight defense, so this game could go either way. Purdue has a couple of decent running backs in Raheem Mostert and Akeem Hunt, and with the Illini defense not doing well against the run with teams that have durable backs, if that tandem gets into a groove, they could put up some good sized numbers in terms of rushing yardage. This is also one of the "trophy games" for the Illini, as Illinois and Purdue play for "The Cannon". Illinois won the trophy last season, and have not won it back to back since the 2002 season. The Illini are 3-2 overall and 0-1 in the Big Ten. It seemed like forever since the Fighting Illini volleyball team last played at Huff Hall, but last weekend they finally returned home to welcome the two newest members of the Big Ten, Rutgers and Maryland. The Illini swept the Terrapins on Friday night, and did the same with the Scarlet Knights on Saturday evening. The Illini continued their home success on Wednesday evening when they welcomed the #18 ranked Minnesota Golden Gophers to Huff Hall for a televised match on the Big Ten Network. The Illini prevailed in 3 straight games once again to down the Gophers. The Illini have now won 13 straight games since losing the third game to Creighton last month. With the win on Wednesday evening, the Illini are 11-3 overall and 3-0 in the Big Ten and will continue their streak of home games on Saturday evening when they take on #5 Wisconsin (7:00 pm CT, no TV). The Fighting Illini women's soccer team took to the road this past weekend, and came away with a split, winning on Friday night 4-1 at Ohio State, but falling 2-1 to #8 Penn State on Sunday. Senior Jannelle Flaws continued her stellar season by scoring twice in the win over the Buckeyes and also scoring the lone goal against the Nittany Lions on Sunday. The Illini are currently 9-3-0 overall and 4-2-0 in conference play, and will play just once this weekend when they travel north to battle in-state rival Northwestern on Sunday in Evanston (5:00 pm CT, no TV). Last Saturday was a long day at Memorial Stadium in Champaign. A long day. Faced with the possibility of severe storms around halftime, the Fighting Illini and the Bobcats of Texas State squared off in the Illini's final non-conference game of the season. Being as I also double as an event staff supervisor inside the stadium on game days, we finally had to put our evacuation plan into place when the storms hit Champaign-Urbana, albeit an hour earlier than previously predicted. The game itself was another subpar performance by the Illini, although they once again found a way to win the game, coming back from yet another fourth quarter deficit to win their third game of the season. The game started out with a bang, as Josh Ferguson took a backwards lateral from quarterback West Lunt and took it 75 yards for the opening score of the game. After a missed extra point by Taylor Zalewski (more on that later), the Illini led 6-0. The game was suspended with 13:35 left in the first half and the Illini trailing 14-6, and the delay lasted for nearly two hours before resuming. The Bobcats went ahead even further at 21-6, sending a collective groan throughout the stadium of the fans that had managed to hang around and watch the game. The Illini finally woke up in the second half, where they have played much better this season, as Lunt found freshman Mikey Dudek for a touchdown, as well as Ferguson for another score. On the day, Ferguson carried the ball 14 times for 190 yards and 3 total touchdowns, two on the ground and one receiving. A change in the kicking game was also made, with Zalewski being replaced by David Reisner and his glow-in-the-dark shoes. Reisner connected on all three of his extra point attempts, and also kicked a 19 yard field goal in the process. However, the Illini showed that they have resilience, as they once again mounted a comeback in the late stages of the game, capped off by a 45 yard interception return for a touchdown by V'Angelo Bentley. Bentley is now an answer to a trivia question that reads as follows: Name the only two players in Illinois history to have a kick return for a touchdown, a punt return for a touchdown, and an interception returned for a score. The other player is none other than Red Grange, so Bentley is in very good company regarding that statistic. Overall, the Illini haven't been impressive in their 3 wins this season, but nevertheless, they are halfway to becoming bowl eligible. Head coach Tim Beckman has continued to say that the Illini are getting better as a team, but the margin of victory against the teams that you should have beaten by more points, the jury is still out as to how much progress they have made since last season. So, bring on the Big Ten season! The Illini have a tall order in their conference opener this Saturday evening, when they travel to Lincoln, Nebraska to take on the #24 Nebraska Cornhuskers at Memorial Stadium in Lincoln (8:00 pm CT, BTN). The Cornhuskers come into the game with the Illini at 4-0 overall, having defeated the Miami Hurricanes 41-31 last Saturday in Lincoln, and boast one of the league's top running backs in Ameer Abdullah, Abdullah had a great day on the ground for Nebraska in the win over Miami, rushing 35 times for 229 yards and 3 touchdowns on the day, including a TD| reception. Since the Illini have had some trouble stopping the run against all four of their opponents thus far, it appears that Abdullah will be poised to have another big day on the ground for the 'Huskers. Nebraska comes into the game as a 20 point favorite, and if the Illini want to entertain any chance of springing an upset on the road, they will have to play a perfect game in order to achieve that. However, the prospects of that feat look dim at best, This is the second straight season that the Illini open the conference season at Nebraska, with the Cornhuskers visiting Champaign to open conference play in 2015. The Fighting Illini women's volleyball team continued their early season success this past weekend, winning three straight matches at the Creighton Classic in Omaha, Nebraska. The Illini defeated the host Bluejays on Friday night in 4 games, then came back on Saturday morning to take down Colorado in 4 games as well. The Illini completed their sweep by defeating South Dakota in 3 straight games. The Illini wrap up the non-conference season with an 8-3 record, and will begin a string of home games at Huff Hall, a place they haven't played in for what seems like forever. The Illini will welcome the two newcomers to the Big Ten, hosting Maryland on Friday evening (7:00 pm CT, No TV) and Rutgers on Saturday night (7:00 pm CT, No TV). As with the volleyball team, the women's soccer team continues to play well, as they won a couple of matches at home this past week. Last Thursday, the Illini took down Indiana 2-0 in a mid-day matinee, followed by a 3-0 victory over Purdue, in which Illinois' Janelle Flaws scored all three goals in the game in a span of about 10 minutes. Through the season thus far, the Illini have recorded six shutouts so far, which ties a record of clean sheets through this point in the season in school history. The Illini are 8-2 overall and 3-1 in Big Ten play, and will go on the road this weekend to continue conference play. The Illini will travel to Columbus, Ohio to battle the Ohio State Buckeyes on Friday night (6:00 pm CT, No TV), then will go further east on Sunday to take on the #8 ranked Penn State Nittany Lions on Sunday afternoon (12:00 pm CT, No TV). John Groce must be the hardest working coach that there is in college basketball, and it may be finally starting to pay off. Groce had two recruits on campus this past weekend, guard Jalen Coleman-Lands from Indiana (La Lumiere Prep) and center Elijah Thomas from Texas (Lancaster), and despite all of the weather related concerns during the football game, both visits supposedly went very well. Coleman-Lands' visit apparently went so well that on Monday, he committed to the Illini, making him the first recruit from the Hoosier state in 30 years to choose the Illini. For trivial matters, the last person from Indiana to play basketball at Illinois was Scott Haffner, back in the 1983-84 season. Coleman-Lands will join D. J. Williams and Aaron Jordan as 2015 recruits, and hopefully Groce can add a couple more players to that list before the signing period in November. For those of you that are concerned about possible getting too many recruits in a given year, remember one thing: John Groce can count. As far as the State Farm renovation goes, things are progressing nicely, and the new blue seats are installed in the 200 level (formerly C section). That is the main change that fans will notice this season, with more changes to be made before the 2015-16 season. With the addition of the new seating, they have taken out the portal areas in that section of the arena, which means that a basketball attendance record will be set at some point in the 2014-15 season. The new capacity of the arena for this year will be somewhere just over 17,000. Stay tuned for more changes. A lot of things can be taken from last weekend's Illini loss at Washington, but the most obvious observation would be that the Illini received a cold dose of reality in their 44-19 loss to the Huskies on Saturday in Seattle. A lot of questions were answered, most namely the fact that the defense still isn't quite ready to advance to that next level, and the reality in that statement is we might not know for a couple more weeks just how far they have left to go. The Illini fell behind early against Washington, and the Huskies' speed was evident, especially on the plays that they ran back for touchdowns coming off of Illini turnovers. The first two games for the Illini spawned several warning signs, specifically since they didn't blow out either opponent and had to come back in each game in order to win, so the first real test against a power conference foe seemed to tell the story. For the game, Illini quarterback Wes Lunt was efficient, completing 16 of 26 passes for 230 yards and two touchdown passes, both going to junior college transfer Geronimo Allison. Allison caught 6 passes for 160 yards, and showed why the Illini coaching staff targeted him as someone who could help immediately on the receiving end, a position that was severely depleted with graduation a year ago. Freshman sensation Mikey Dudek caught 5 passes for 43 yards, and remains one of Lunt's favorite go-to guys. With the Illini falling behind 21-3 at the end of the first quarter, the run was once again abandoned, with Josh Ferguson getting the lion's share of the carries, rushing 11 times for 52 yards. If there is anything positive to take away from this loss, according to Tim Beckman, it would be the play in the second half. "If you look at the score in the second half, we won that portion of the game 7-6", Beckman said on Monday to his weekly address of the media. Yes, that's true, but by the time the fourth quarter rolled around, the outcome of the game wasn't in question and the Huskies began to grind the game from the rushing standpoint. So, what happens next you ask? The Illini return home this Saturday to take on the Bobcats of Texas State at Memorial Stadium (3:00 pm CT, ESPN News). The Bobcats come into the game with the Illini at 1-, having derailed FCS school Arkansas-Pine Bluff in their opener 65-0, and losing to Navy last weekend 35-21. The Illini need an impressive performance on all sides of the ball in their final pre-conference tuneup because the road gets a whole lot tougher after this game. Even though this is considered a lesser opponent, nothing should be overlooked at this point, as the Illini still try to find their identity. The Bobcats will be coming into Champaign with upset on their minds, and if the Illini aren't careful and play to the level that they are capable of playing, that scenario just may in fact play out. We shall see. The Fighting Illini women's soccer team began Big Ten play last week, and through two games in the conference slate, managed a split. The Illini opened conference play with a 2-0 loss at Iowa last Thursday, then came back on Sunday with a 3-0 win at Nebraska. The Illini carry a 6-2-0 overall record and a 1-1-0 Big Ten mark into this weekend, when they host their neighbors from the state of Indiana. The Illini will open up on Friday with a rare Friday afternoon contest, when they entertain the Indiana Hoosiers (2:30 pm CT, BTN). The annual Soccer Fest game will take place on Sunday afternoon when Purdue comes to town (1:00 pm CT, no TV). Coach Janet Rayfield has been pleased so far with the start this season, and thinks that the national television exposure on the Big Ten Network will be good for the younger players. "I know a lot of the younger players have not had an experience of playing on television, so this will hopefully ease their nerves a little bit for the excitement that this presents", Rayfield said on Monday about some of her younger players and getting the nervous jitters out of the way. Kevin Hambly's women's volleyball team continues their pre-conference slate away from Huff Hall, and last weekend, came away with winning 2 out of 3 matches in the Blue Raider Bash at Middle Tennessee State in Murfreesboro, Tennessee. The Illini defeated the host Blue Raiders in 3 straight games, before being upset by Virginia Tech in 5 games earlier on Saturday. The Illini bounced back in their third match, taking Washington State in 3 straight games to close out the weekend. The Illini are currently 5-3 on the season, and will close out the non-conference portion of the season this weekend, when they travel to Omaha, Nebraska to compete in the Creighton Classic. The Illini will take on the host Blue Jays on Friday night (7:00 pm CT, no TV), before playing a pair of matches on Saturday. The Illini will face off against Colorado on Saturday morning (10:00 am CT, no TV), before closing out the weekend with South Dakota (5:30 pm CT, no TV). Finally, to close out this week's Illini Guy Report, with college football in full swing, the thought of college basketball is not that far off on the horizon as well. The Illini received some disheartening news late last week, when their starting point guard for the past two seasons, Tracy Abrams, sustained an ACL injury and will miss the entire 2014-15 season. Abrams, a senior, was counted on to be one of the floor leaders for the Illini, and now in his absence, senior transfer Ahmad Starks and sophomore Jaylon Tate will have to step up and fill the void. The waiver denial of Starks from last season was actually beneficial, as now the Illini will have him for this season while Abrams takes a medical redshirt. Abrams will be back for his senior season in 2015-16. This will also be a busy weekend for recruits on the Illinois campus for head coach John Groce. Groce will welcome 5-star big man Elijah Thomas to campus, and it was announced earlier in the week that guard Jalen Coleman, a 4 star prospect from Indiana, has moved his visit up and will also visit Illinois this weekend. Coleman has narrowed his choices down to the Illini and UNLV. Sooner or later, Groce will land one of these players, but it remains to be seen who will be the first in a series of dominoes to fall. Things are starting to look up for the Fighting Illini football team through the first two games of the 2014 season. After coming back in the first week to defeat Youngstown State, the Illini welcomed the Hilltoppers of Western Kentucky and their high-powered offense into Memorial Stadium. The Illini jumped on top early thanks to Josh Ferguson's 1 yard touchdown plunge and that lead held up until Western Kentucky scored the next 17 points to grab a 17-7 lead. The Illini scored before the end of the first half as a pass intended for Geronimo Allison was dropped and scooped up by freshman Mikey Dudek, who fell on it in the endzone to make the score 17-14 at the break. In the second half, the teams exchanged scores, and Illini quarterback Wes Lunt continued where he left off in the fourth quarter of the Youngstown State game. Lunt threw touchdown passes to Martize Barr (8 yards) and Justin Hardee (62 yards), en route to a 35-50 performance for 456 yards, just 6 yards shy of the Memorial Stadium for yards passed for in a game. The Illini defense even came through, as safety Taylor Barton recovered a fumble and ran it back 77 yards for a score. With the win, the Illini improve to 2-0 on the season and have a chance to be the fifth team in Illinois history to start a season 3-0. Western Kentucky falls to 1-1 with the loss, and their aerial show that they had against Bowling Green in week 1 was not nearly as effective against the Illini. The Illini will venture away from Champaign for the first time this Saturday, when they travel to Seattle, Washington to battle the Washington Huskies at Husky Stadium (3:00 pm CT, FOX). The Illini and Washington met last season at Soldier Field in Chicago, a game that the Huskies won 34-24. However, Washington lost quite a few players off of that team, and will offer a new look to the Illini when they meet on the field Saturday afternoon. The Huskies come into the game with the Illini at 2-0 as well, and are coming off a 59-52 victory over Eastern Washington last Saturday in Seattle. The Huskies pose a threat on the ground, as running back Lavon Coleman who is averaging just under 100 yards per game so far. The Huskies have used two quarterbacks this season, starting Jeff Lindquist in the first game, and Cyler Miles in the win over Eastern Washington. Miles was 14 of 24 passing for 180 yards and a touchdown in his win, This will be a good barometer for the Illini, and if they can somehow sneak out a win on the road, the prospects of a successful season will be well within their grasp. The Illini women's soccer team continues to play well, as they improved their season record to 5-1 last weekend with a pair of wins in the College of Charleston Tournament in Mt. Pleasant, South Carolina. The Illini defeated the hosts, College of Charleston 3-0 on Friday night, then came back to defeat UAB on Sunday by a 3-1 score. The Illini are to begin Big Ten play on Thursday evening, when they travel to Iowa City to battle the Iowa Hawkeyes (7:00 pm CT, No TV), followed by a match at Nebraska on Sunday. Finally, this week, some basketball news off the court. Head Coach John Groce continues his assault on the recruiting trail, but has yet to land one of the big names that he has sought. The latest disappointment for Illini Nation is Jalen Brunson, the talented point guard out of Stevenson High School in Lincolnshire. Briinson, whose father Rick played at Temple, chose Villanova over the Illini, fueling speculation that the family wanted to get back to the Philadelphia area. Groce still has a couple of targets on his radar, including Jawun Evans of Texas and Carlton Bragg from Ohio. One of these times, Groce will land one of these big names, but until then, it's once again being the bridesmaid. 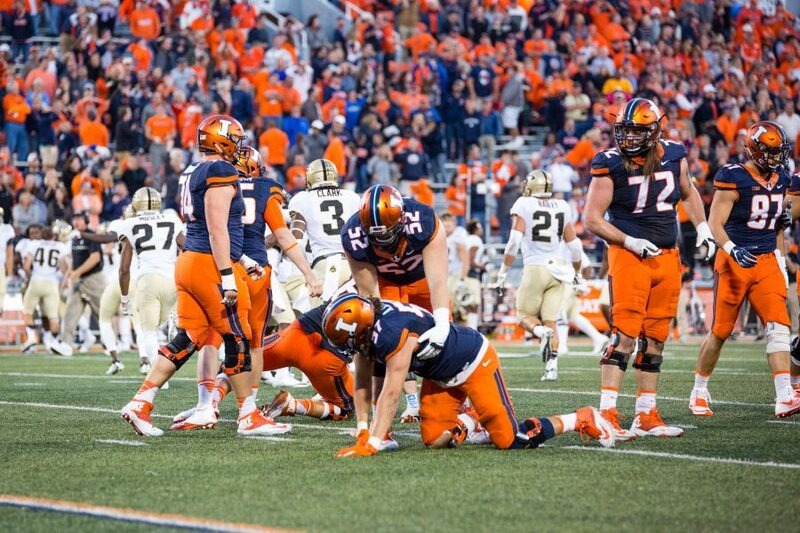 A win is a win, or at least that is how the Fighting Illini football team feels after their narrow escape over Youngstown State in the season opener last Saturday at Memorial Stadium in Champaign. The Illini struggles against the Penguins, getting off to slow start, and taking nearly three quarters before shaking off the cobwebs and taking care of business. Sophomore transfer Wes Lunt, named the starting quarterback last week for the Illini, had the best debut by an Illini signal caller in school history, completing 24 of 38 passes for 285 yards and 4 touchdown passes. Lunt, like the Illini, started slow, but came alive in the fourth quarter, going 9-11 for 155 yards and 3 touchdown passes in the final stanza. "I was just happy to get the win, and it felt really good to put things together finally", Lunt said on Monday of his performance on Saturday. Two freshmen made impressive debuts for the Illini on Saturday, those being wide receivers Mike Dudek and Malik Turner. Dudek caught 3 passes for 61 yards, including an 8 yard touchdown, his first career touchdown grab as an Illini. Turner snagged 4 balls for 42 yards, while junior college transfer Geronimo Allison caught 2 passes for 43 yards. The defense, a major issue a year ago for Illinois, fared much better on Saturday, as they kept the Illini in the game until the offense took over. Even more impressive was the red zone defense, which held Youngstown State to just one touchdown, a 2 yard run in the fourth quarter. Austin Teitsma had a superb game for the Illini, recording a career high 9 tackles, 2.5 of those for losses, and recorded a half-sack. Teitsma, a senior, plays with a lot of emotion on the field, but is a fun-loving individual off the field. "I just try to go out there and have fun and give it my all, and we do a lot of joking around in the locker room after games, which eases the tension quite a bit", Teitsma said of his approach to playing. Illinois (1-0), now faces a stern test this coming Saturday, when they welcome the Hilltoppers of Western Kentucky to Memorial Stadium (11:00 am CT, BTN). The Hilltoppers are coming off a 59-31 win over Bowling Green last Saturday, a game in which quarterback Brandon Doughty set numerous records. Doughty completed 46 of 56 passes for 569 yards and threw 6 touchdown passes in the rout of the Falcons. This is not very good news for the Illini secondary, who will undoubtedly be very busy trying to defend against the pass. The Hilltoppers can be compared to Louisiana Tech, a team that came into Champaign two seasons ago and lit the Illini up en route to the victory. Western Kentucky runs a no-huddle offense, which resulted in 97 plays from scrimmage in the win against Bowling Green. The Hilltoppers play in Conference USA, and are coached by Jeff Brohm, who played his collegiate football at Louisville. Brohm, as well as secondary coach Mike Cassity, both coached at Illinois during the Ron Zook tenure, so they are very familiar with the Big Ten and Illinois. For the Illini to come out on top against the Hilltoppers, they will need to limit their mistakes, and also get the offense into high gear to keep up. The Fighting Illini women's volleyball team got their season off to a strong start, winning three straight matches in the Illini Classic this past weekend at Huff Hall in Champaign. The Illini defeated Long Beach State on Friday evening 3-0, then played a pair of matches on Saturday, disposing of Southern Illinois 3-0 in the morning, then coming back to defeat the #20 ranked North Carolina Tar Heels in 3 straight games. For the weekend, the Illini did not lose a game, and gained some valuable experience in the process. Illini senior Liz McMahon was named Most Valuable Player of the Illini Classic, and on Monday, was also named the Big 10 Player of the Week. However, the competition gets a whole lot tougher this coming weekend, when the Illini venture away from Huff for the first time to take part in the Big 10/Pac 12 Challenge in Stanford, California. The Illini will play UCLA on Friday evening, before taking on what will probably be the new #1 team in the AVCA rankings, the Cardinal of Stanford on Sunday. A daunting task, no doubt, but Illini coach Kevin Hambly likes the idea of facing the top competition so early in the season. "We know UCLA will be tough, and Stanford will probably come in as the top team, but we just want to go out there and play volleyball, and see what happens", Hambly said of his early season test. We will surely know a lot more about the Illini volleyball team after this weekend, and win or lose, one thing is clear: Hambly does not back down from the competition. The Fighting Illini women's soccer team started their season before any other sports team on campus, and currently stand at 3-1 after the first 4 matches of the season. After a season opening 3-1 loss to Notre Dame back on August 22nd, the Illini bounced back to defeat Louisville 2-0 and Arizona State 3-1 at home, while venturing on the road for the first time, and coming away with a 1-0 overtime win against Oakland University in Rochester, Michigan on Sunday. The Illini will once again be on the road this weekend, when they will take part in the College of Charleston Tournament in Mount Pleasant, South Carolina. The Illini will face the host team, the College of Charleston on Friday evening (6:30 pm CT, no TV), then will take on UAB on Sunday morning (11:00 am CT, no TV) to conclude the tournament. It is no secret that the main reason why the Fighting Illini football team didn't exactly excel on the field last season was the defense, and the lack of talent on that unit the past couple of seasons. In this, the second of three parts on previewing the 2014 Illinois Fighting Illini football season, I will be looking at the defense this time, and the transformation that is undergoing on that unit. When Illinois head coach Tim Beckman decided to retain defensive coordinator Tim Banks at the end of last season, many people began to shake their heads in disbelief and wondered (some aloud, mind you) if Beckman's decision would ultimately cost him his job. Banks hasn't exactly been solid in running his unit, but the lack of talent may have something to do with that. Of the 22 players on the two-deep roster, 20 players return from last season, giving the Illini some much needed experience, as well as some added depth to the roster, as younger players fill in the necessary gaps. The two players that did not return, defensive lineman Tim Kynard and linebacker Jonathan Brown, both graduated. The defense, while still rather suspect, at least has a chance to improve on a very disappointing season in 2013. Anchroing the defensive line are a cast of returning players from last season, including Austin Teitsma, Dawuane Smoot, Teko Powell and Kenny Nelson. Perhaps the best news regarding these four players is that Teitsma is the only senior in the group. Teitsma, a media favorite, plays with a lot of intensity on the field, and would like nothing more than to go out with a bowl appearance. Much like Beckman did on the offensive side of the football, he went out and picked up some junior college players to help fill in needed gaps and bolster the experience on the line. One of the more intriguing players is Jihad Ward, who has quite a story himself about how he got to practice at Globe Tech in New York. Ward, who stands 6'6 and weighs 295 pounds, is a monster of a man, and seems to swallow up people in his path. Another player that Beckman brought in was Joe Fotu. Fotu came in at the start of the 2014 spring semester and participated in spring drills, so he is somewhat familiar with the types of schemes that Banks runs. The key to the success for the Illini this year will focus on this defensive line, but the linebacking corps also returns quite a few players, which can do nothing but aid in securing the middle of the defense. Losing Jonathan Brown last season opened up a hole in the linebackers for the Illini, but they will have some key players back to help anchor the unit. Leading the charge will be junior Mason Monheim, who has started since he was a freshman. Monheim has gotten steadily better over the past two seasons, and is ready to take the next step and be a leader of the unit as a whole. Another linebacker, T. J. Neal, a sophomore, really came into his own last season and has picked up right where he left off so far at Camp Rantoul. During the first week of practice this fall, the Illini received some bad news when linebacker Mike Svetina sustained a foot injury and will be sidelined 8-10 weeks. Hoping to step up in Svetina's absence will be Kenny Nelson, a junior, or Ralph Cooper, who is finally getting a chance to show what he is made of in his final season of eligibility. The linebackers have not been the main issue on the defense over the past couple of years, and judging from the talent returning this season, they will continue to be one of the strong points. It has often been said that is your secondary leads the team in tackles, then something on the interior line is seriously amiss. For the Fighting Illini in 2014, the secondary returns intact, and looks to improve even further than the strides that they took in 2013. Leading the way will be V'Angelo Bentley, who will be one of the cornerbacks when the defense lines up August 30th against Youngstown State. Other players of significance will be Caleb Day, Dillan Cazley, Zane Petty and Darius Mosley. Day, who came on at the end of last season, tweaked a hamstring during the week of practice at Rantoul, and may be slowed as a result. Petty, who came in last season as a juco player, looks to have another strong season, while Cazley and Mosley, both in their second seasons, both saw quite a bit of action last season as freshmen. Other players that may draw some name recognition will be Eaton Spence, Jaylen Dunlap, and Chris James. James, who was originally enrolled at Illinois until academics forced him to go the juco route, is back once again, and if he can keep his attention focused on academics intact, he may be a force to be reckoned with. Next week, the third and final installment of the preview will focus on special teams, as well as game week preview of the Youngstown State game (8/30, 11:00 am, BTN). Stay tuned! With the beginning of August now upon us, it is once again time for football season, whether it be high school, college, professional, or youth leagues. Football is the same pretty much at whatever level it is played. The Fighting Illini have begun preparations for the 2014 season, practicing the first week of their annual camp on campus, while balancing finals. Now, the focus shifts to Rantoul, and their annual trek north to where the public (and media) can get a glimpse of the team and actually watch the team go through workouts. Head coach Tim Beckman begins his third season at the helm, a season that many believe to be a pivotal one. Illinois is coming off of a 4-8 season in 2013, is looking to take that next step, which is obtain bowl eligibility. In this, the first of three parts of the 2014 preview, I will look at the offensive side of the ball, from the guys up front to the ones in the backfield. The offensive line has been an area of concern in the past couple of years, mainly due to undersized and inexperienced players and not a lot of depth at the guard and tackle positions. However, as the Illini head into the 2014 season, those questions seem to be rectified for the most part. The center spot is pretty much set, as Alex Hill will snap the ball. However, Joe Spencer could see some time at center as well, which would move Hill to a guard spot. Speaking of the guards, Ted Karras and Michael Heitz look to be the frontrunners at the moment. At the tackle position, Simon Cjivanovic has one of the spots nailed down, while the other tackle position seems to be a two person battle between Patrick Flavin and Christian DiLauro. Beckman had a slight hiccup with the offensive line coach when A. J. Ricker left Illinois to take the same position at his alma mater of Missouri with just two weeks remaining in summer school. That void was quickly filled when Tom Brattan was hired to replace Ricker. Brattan spent the last twelve years at Maryland, which is now in the Big Ten. Brattan brings a lot of experience to Illinois, and has bridged the gap nicely in his short time in Champaign. The experience of the line that returns virtually intact from last season is a sigh of relief for Beckman, who has some depth on the line as well. The quarterback battle has been one of the more talked about topics during the off-season, and now that training camp is upon us, we have actually been able to see all three of these guys in action. Senior Reilly O'Toole brings experience to the position, while Aaron Bailey can move in the pocket and resembles more a runner than a passer. However, the clear cut favorite for the starting job is probably going to be Wes Lunt, the sophomore transfer from Oklahoma State that played his high school ball at nearby Rochester. Lunt brings a solid frame, plus an uncanny ability to throw the football, something that Illinois fans haven't seen in quite a few years. Replacing Nathan Scheelhaase will be tough, but Lunt possesses the talent to take over and even exceed where Scheelhaase left off. After the first two days of Camp Rantoul, it is becoming more clear who will be listed where on the depth chart. Lunt is quite a ways ahead of O'Toole, while Bailey is quite a bit behind O'Toole. Throwing the ball is something that Lunt does well, and he will have some new faces to get the ball to this season. The normal players are still there from last season, in Justin Hardee and Martize Barr, but keep an eye out for several young players that could make a big splash once the season begins. Freshmen Mikey Dudek and Malik Turner have opened many eyes thus far, and both should see quite a bit of action. Dudek is small at only 5'11, but is lightning quick and should be able to break away from defenders provided he can catch the ball. Turner is much bigger at 6'3 and 205 pounds, and comes from the powerhousae of Springfield Sacred Heart-Griffin, where he excelled. Beckman brought in a couple of junior college players as well in Geronimo (Gmo) Allison and Tyrin Stone-Davis. Allison is 6'4, and is pretty quick for his size. He should fit in nicely in the rotation. Also figurng in the mix for catching passes are the tight ends. In offensive coordinator Bill Cubit's offense, the tight ends were a formidable option last season, and should see a similar load this season. Returning are the two main pass catchers in Jon Davis and Matt LaCosse. LaCosse caught three touchdowns last season, and has the potential for another huge season. In addition to these two, Beckman brought in another junior college player in Dallas Hinkhouse. Barr, Allison and Hinkhouse all played at Iowa Western Community College, giving that school a pipeline to Champaign with some good talent. The running game returns virtually intact as well from last season, wih junior Josh Ferguson listed as the feature back. Senior Donovonn Young had a sub-par season in 2013, but has had a good first week of camp and will look to bounce back this season. Devin Church and Kendrick Foster, two of the younger players at the position, will also see considerable action. Up next week, a look at the defensive side of the football, a concern that was very evident last season. Effective July 1, the Big Ten Conference grew by two more teams to 14, a number that should be sufficient, at least for the time being. The Scarlet Knights of Rutgers and the Terrapins of Maryland joined the ranks of the Big Ten, and with it, bring some storied history with them. But how well do we know our new allies on the east coast? Rutgers, which is in New Brunswick, New Jersey, is essentially in the metropolitan New York City area, a section of the country that the Big Ten has been wanting to tap into for quite some time. The Scarlet Knights have been much more successful on the football field in the recent past than they have on the basketball court, something that rival teams in the conference do not want to hear. The Rutgers football team, who is coached by Kyle Flood, finished the 2013 season at 6-7, including a 29-16 loss to Notre Dame in the Pinstripe Bowl at Yankee Stadium in the Bronx. Maryland, who hails from College Park, Maryland, is in suburban Washington, D, C,, another area that the Big Ten has been eyeing for several years. The addition of both Rutgers and Maryland are a major reason that the conference is expanding their reach to take the Big Ten Tournament on the road, with the men's tournament scheduled for D. C, in 2017, and the possibility of Madison Square Garden in 2018, The Terrapins, who are coached by Randy Edsall, finished 7-6 in 2013, and like Rutgers, saw their season end with a bowl loss, a 31-20 setback to the Thundering Herd of Marshall in the Military Bowl in nearby Annapolis, Maryland. Maryland has a familiar face on its coaching staff, as Mike Locksley takes over as the offensive coordinator. Tom Brattan, who was not retained by Edsall, coached the offensive line at Maryland. (more on Brattan later). With the start of fall training camp just a couple weeks away, Coach Tim Beckman is preparing his Illinois football team for the start of the 2014 season. Beckman, who begins his third season at the helm of the Illini, is under close scrutiny, as he needs a greater level of success in order to see a fourth year, and that can be translated as getting to a bowl game. Beckman saw his season start off on the wrong foot, as offensive coordinator A. J. Ricker left last week to take the same position at his alma mater, Missouri, Ricker's departure was not the best in terms of timing, but you can't really fault him for wanting to pursue his dream job at the place where he played. Tom Brattan, who had spent the past 13 years at Maryland coaching their offensive line. The addition of Brattan makes this the fourth offensive line coach in four years for seniors Simon Cvijanovic and Michael Heitz. They have seen Ricker (2013), Luke Butkus (2012) and Joe Gilbert (2011) during their tenure, and according to Brattan, he doesn't plan to go anywhere anytime soon. "I have a reputation for staying in one place for long periods of time, as my recent tenure at Maryland shows", Brattan said on Wednesday, as he met the Illinois media for the first time as Illini offensive line coach. Brattan previously coached at Northwestern in the mid to late 1990's, and wanted to make it known to young linemen like Nick Allegretti that he would be around for awhile. "I told Nick and the other guys that I plan to be around a while, and they need to hear that, especially coming from me", Brattan said. Beckman also received some tragic news on Monday, as former lineman Shawn Afryl died of an apparent cardiac arrest after practice at Winona State University. Afryl, who played in only one game for the Illini, in 2012, had received his degree from Illinois and transferred to Winona State to finish out his eligibility. Beckman, who was visibly moved by Afryl's death, conducted a team meeting for anyone that wanted to talk about the situation. "Anytime you have a death of a player, whether or not he is currently your player, it still hits home and he will always be part of the family", Beckman said. We have reached the point of the year where sports action in the collegiate ranks takes a bit of a break. That is certainly not the case with the Fighting Illini men's basketball team, who have begun individual workouts. The two newcomers to the team, LeRon Black and Michael Finke, are both on campus and enrolled in classes, and the remainder of the team that returns from last year are beginning their workouts as well. With that being said, Coach John Groce put his team through the Navy SEAL training for the second consecutive year. Last year, with nine newcomers to the team, Groce thought it would be a great team building exercise for everyone to gel and get to know one another. It seemed to work out just fine last season, so Groce put his team through the four day program once again this week. With Black and Finke the only additions to the team, the nucleus is there, and for Ahmad Starks and Aaron Cosby, two players who sat out last season due to transfer guidelines, the training was a little easier, but that doesn't mean that it was any less challenging. Starks, who is looking forward to getting back into the swing of basketball after sitting out last season, thought the training was very helpful. "It gives up experience in team building, which is very helpful both on and off the court", Starks said. The players are put through several rigorous activities, which they are expected to use teamwork to navigate certain situations. One such drill involved a boat (pictured above) that was filled with ice and water. The players would take turns, one by one, by diving underneath each partition in the boat, then coming out at the end. The purpose of the drill was to get fear out of the players' minds of jumping into a very cold environment. The coaches, who numbered 8 bodies, challenged the players, who were 13 strong, to see who could do it the fastest. When both groups completed the challenge earlier in the week, the players did it in 5 minutes. The final morning of the challenge, they did it in under 2 minutes, which was astounding. "The players calmed their fears, and completed the challenge in a much quicker time, because they were able to attack the fear of the water", Groce said of his players' improvement. The coaches also took another attempt at bettering their time, and Groce's only request before they took their turn was "more ice". SEAL trainer John McGuire, who spent ten years himself as a Navy SEAL, goes all over the country with this program. McGuire stresses the principle of getting people to become leaders, not only on the basketball court, but in the game of life itself. "I want these players to realize that when they are 30 years old, or 40 years old, and they have a family and a problem comes up, they will know how to handle it by using these principles. Groce, who has had their team take this training for the last couple of years, thought they really improved from the start of the training until the end. "There's no question that they got better from when they started, and John (McGuire) really has been instrumental in getting guys like Tracy (Abrams) and especially Starks out of their shell and becoming more vocal leaders", Groce said of the influence that McGuire has had on his players. Abrams, who has been a floor leader for the Illini the past couple of seasons, never has been the vocal leader for the team, but training like this can go a long way in changing that. "I thought the training last season was a little bit harder that this year's, because we weren't as connected as we were this time around. John (McGuire) makes you talk out here, and that not only character, but camaraderie as well", Abrams said of his experience with the training. It's no secret that the Illini have had adversity on and off the court this past off season, but they have had their fair share of success as well. Groce is a very integral part of that process, and his treatment of the Darius Paul situation further brings that point home. Paul was dismissed from the team last spring after an altercation with Champaign police. Paul, the younger brother of former Illini Brandon Paul, will be attending a junior college to keep up his basketball skills, and still remains hopeful that he will rejoin the Illini next season. Normally, I use this space to blog about happenings and results of the various sports teams for the Fighting Illini. I still fully intend to do just that, but first allow me to go off the beaten path and rant a little bit about what the conference has been doing to improve their image. On Tuesday, the Big Ten Conference announced that the 2017 Big Ten Tournament will be played at the Verizon Center in Washington, D.C. Yes, that Washington, D. C., as in our nation's capital. D. C., otherwise known as the center of the Big Ten markets. Give me a break. With the addition of Rutgers and Maryland to the conference on July 1st of this year, the Big Ten is striving to improve their presence on the East coast, and this is the latest in a series of events to make that happen. Last month, the Big Ten established an office in New York City, and earlier this week, the Big East and the Big 10 agreed to form a challenge similar to the one that is shared with the ACC. But why Washington D.C. you ask? I'm not entirely sure why this location was chosen, since the only team this really benefits is Maryland, which is about 90 minutes away. New York City makes much more sense as a rotation site, and I'm sure before long, that Madison Square Garden will be in the mix as far as hosting the tourney. Several questions arise with this decision, namely the travel issues for the competing schools. Compute exactly how far the distance is from Lincoln, Nebraska to Washington, D.C. and you will begin to see what I mean. The Big Ten has for years had a midwestern feel, and recent expansion has taken a little of that away. We can't say that we didn't see this coming, because with all of the expansion in both east and west directions, the possibility of exploring other sites as tournament host was a foregone conclusion. But what about Detroit?, or Milwaukee.? Heck, give Milwaukee or Cincinnati a shot at it, because at least they are driving distance for most fan bases and media to cover the games. In the past, it has been a common occurrence for schools that lose on the first day to begin unloading their tickets for the rest of the tourney. Those teams that move on in the tournament, especially the fan bases within 3-4 hours of Chicago or Indianapolis, then converge on the venue hoping to scoop up tickets of the dejected fans leaving the arena. This more than likely won't be happening at the Verizon Center, or eventually perhaps Madison Square Garden in the future. Basically, it all boils down to money, which is the main focus of the move east. Big Ten commissioner Jim Delany has done a phenomenal job as the leader of the conference, and with ventures such as the Big Ten Network, has lined the pockets of each institution in the conference as a result. However, I'm not sure how the attendance will be for this change, but we have a couple of years to worry about that. Maybe I'm just being a little selfish, since it has been a close drive for me over the past 10 years. The switch to the east coast will no doubt be criticized by many, but as has been the result with Delany over the past few years, anything he touches turns to gold. I'm sure this one will be no different. Now, back to the sports on the field. The Fighting Illini baseball team finished off a perfect week, going 4-0, including a 3 game sweep of the Michigan State Spartans last weekend at Illinois Field. The Illini were sparked by junior Casey Fletcher, who found himself in several game winning situations, and came through in the clutch in every single one of them. Fletcher, who hit 3 home runs earlier in the week to beat Southern Illinois, hit 2 more against the Spartans, to help pace the Illini. For his efforts, Fletcher not only received the Big Ten player of the week honors, but also garnered the National player of the week award as well. Fletcher hit .471 for the week, with 10 RBI to go with those five dingers. The Illini (27-17 overall, 13-5 Big Ten), jumped into a tie for second place with Nebraska, and will go on the road for the final two series of the regular season, starting this weekend with Iowa. The Illini and Cornhuskers conclude the regular season in Lincoln against Nebraska, which could be an important series on many different levels. The Fighting Illini women's softball team finished off the regular season on a high note, sweeping Penn State in 3 straight games at State College last weekend. The Illini, who enter this week's Big Ten Tournament with a subpar 23-25 overall record, and 7-16 in the conference, will face Iowa on Thursday afternoon at approximately 4:30 pm central time. The women's softball tournament will be held in Evanston, and if the Illini get by the Hawkeyes, they will face top seeded Michigan on Friday afternoon. Beginning with the quarterfinals on Friday, each of the remaining games will be televised on the Big Ten Network. Been a while since I last posted, so here goes. Now that the Illinois football spring game is over, the focus can be shifted to the ongoing quarterback battle. Or can it? It is no secret that the main topic of the spring football season has been the battle between the three quarterbacks on the Illinois roster. All three candidates, Wes Lunt, Reilly O'Toole and Aaron Bailey have impressed head coach Tim Beckman with what each player does well, and Beckman is still not going to name a starter. at least not just yet. There have been tons of speculation about who will be "the guy", with most throughout Illini Nation assuming that Lunt will be the one annointed when Camp Rantoul begins. But now that the spring game is in the rear view mirror, more questions abound regarding who will emerge. Teams were picked for the game by a group of seniors each comprising of the Blue and the Orange team, and O'Toole made Lunt the first selection on the Blue team. The Orange team countered with Josh Ferguson with their initial pick. Everyone expected Lunt to start the game, but instead it was O'Toole that led the Blue team to two first quarter touchdown drives. Beckman would have preferred each signal caller to alternate drives, but it was Alex Golesh's call, and Beckman was quoted afterwards saying "blame him for that move". When Lunt did get in the game at the start of the second quarter, the first four plays were running plays, and Lunt's first pass was batted down, while the second one was intercepted. Not exactly a stellar beginning for someone that has been referred to as the "savior of the program". Now, those are not my words, but rather comments that I have heard throughout the spring practice sessions from fans and other types supposedly in the know. It makes perfect sense to laud Lunt in this regard, but O'Toole's performance does open up some possibility that the decision has not been fully made yet. Add in the scrambling ability of Bailey and the decision begins to get even tougher. The Blue team totally dominated the Orange in the game 38-7, and some of the questions on defense are still there, much like they were at the close of last season. This is Beckman's third season with the Illini, and many believe that it could be his last unless the Illini somehow make it to a bowl game. Beckman has stuck his neck on the line by retaining defensive coordinator Tim Banks, and he believes that Banks is the right person to lead the defense. The offensive line is still depth starved, something that also needs to change before the 2014 season begins on August 30th when Youngstown State pays a visit to Memorial Stadium. But for now, Lunt and the rest of the quarterbacks will continue to battle and work out independently, hoping for a decision to be made as who will be the starter. Just don't look for that announcement to come anytime soon. The Fighting Illini baseball team has sprinted off to a decent start to the 2014 season, and much of their success can be attributed to the pitching, which has been nothing short of spectacular this season. After notching back to back 1-0 victories, the Illini ran into some problems as Michigan paid a visit to Illinois Field this past weekend. The Illini got by the Wolverines on Friday by a 1-0 score, as Drasen Johnson and Tyler Jay combined on the shutout. However, on Saturday, the Wolverines brought the hitting sticks, as they beat up on the Illini 17-9. On Sunday afternoon, the Wolverines took the series with a 4-2 win. The Illini end the weekend at 18-13 overall and 6-3 in the Big Ten, and will travel to Normal on Tuesday to take on Illinois State before departing for State College, Pennsylvania this weekend for a three game series against the Penn State Nittany Lions. Terri Sullivan's Illini softball team is in the midst of a five game losing streak, and are coming off of a three game sweep by Wisconsin over the weekend in Madison. The Illini lost a pair of games by a 3-2 score, and also were downed 10-3 in the other game against the Badgers. The Illini are slumbering along, now 18-18 overall and just 2-10 in the Big 10. The Illini will welcome the Blue Demons of DePaul on Wednesday afternoon to Eichelberger Field for a non-conference game, before heading to West Lafayette, Indiana this weekend to battle the Boilermakers of Purdue. Finally, this week marks the official re-branding of the athletic programs by Nike, something that has everyone associated with the program quite excited about. It has been a long time since the logo and the uniforms were updated, and with Nike being the primary sportswear outfitter for the Illini, as well as many other schools, the time has come for Illinois to get their brand updated. The event, which is free, will be held on Wednesday evening in the Great Hall of Krannert Center for the Performing Arts on campus. Some of the athletes from both the mens' and womens' basketball teams, as well as the football team, will be modeling the new digs. People attending the event did need to get a ticket ahead of time, and it there were any that were unclaimed by I-Fund donors, they were to be offered to the general public on a first-come, first-served basis. Stay tuned for the new logos. They call it March Madness for a reason. The Illini, pretty much written off as a lost season a month ago, have seen their season take an abrupt turn for the better, all thanks in part to better play on defense and a lineup change that wasn't the worst thing to happen either. Since a 48-39 loss to Ohio State back on February 15th, all Illinois has done is win five out their last six games, including the last five away from State Farm Center. The only loss in that streak was a blowout loss to Michigan (more on the Wolverines later), 84-53 on Senior Night. The insertion of Kendrick Nunn and Malcolm Hill to the starting lineup has given the Illini new energy, and the players that they replaced, Jon Ekey and Joseph Bertrand, have been embracing their new roles coming off the bench. Nunn and Hill, both freshmen, have been a huge lift to a team that will be playing some sort of postseason, the question is which tournament will they in? Conventional wisdom points to the NIT, but there is still an outside shot (and I mean an NBA level shot) of getting in the field of 68 and the NCAA Tournament. After Illinois' win at Iowa last Saturday night, they finished the regular season at 18-13 overall and 7-11 in the Big Ten, not great numbers, but much better than the season was looking just one month ago. In fact, it took a last season shot by Ekey to defeat the Hawkeyes, and with it, loads of confidence heading into the Big Ten Tournament in Indianapolis. The Illini drew the #9 seed and faced Indiana, the #8 seed in the first game of the tournament on Thursday. The Illini and Hoosiers split the 2 games in the regular season, with the Illini winning 83-80 in overtime on New Year's Eve, while losing 56-46 back in January in Bloomington. The Hoosiers came into the game with the Illini at 17-14 overall and also 7-11 in conference play, and needed a win over the Illini to boost their postseason chances. Illinois jumped out to a quick 9-0 lead on Indiana, but the Hoosiers clawed back to take several leads on different occasions. Tracy Abrams, who has had a disappointing second half of the Big Ten season, came up huge for the Illini, scoring a season high 25 points, and just missing his career best by 2 points. The Illini lived to see another day by defeating the Hoosiers 64-54, and for that, a chance to rematch with Michigan on Friday in the first quarterfinal of the day (11:00 am CT, ESPN). Rayvonte Rice scored 13 points, while Nunn knocked in 10 for the Illini, who improve to 19-13 with the win. Not to get too far ahead of ourselves, but another win in the tourney may open up the possibility of the Illini being mentioned as one of the teams on the proverbial NCAA "bubble". Technically speaking, they probably have to get to the championship game on Sunday and even win the tourney outright to have a realistic chance, but is fun nonetheless to speculate, because as a media member, that is what we do. Indiana,who falls to 17-15 overall with the loss, was led in scoring by Kevin (Yogi) Ferrell, who had 14 points. Will Sheehey added 13 points, while freshman Troy Williams scored 11 for the Hoosiers, who outrebounded the Illini by a 35-32 margin. As is the motto for this time of year, survive and advance, and the Illini know that firsthand. The season came to a very disappointing end last week in Indianapolis for the Illini women, as they were defeated 81-62 by the Iowa Hawkeyes, putting a cap on their season at 9-21 overall. This isn't what Coach Matt Bollant envisioned when he took the job, but then again, the talent level wasn't very good when he came to Champaign. Whatever the case, it is something to build on, as they only lose Amber Moore this year. Bollant has a good recruiting class coming in next year, and with it, a chance to get up into the top half of the Big Ten. It was pretty much an uphill struggle this season for the Illini ladies, and the fact that they finished the season with consecutive losses to the Hawkeyes certainly didn't help. That is what Bollant hopes to build on for next season. The spring sports schedule has started at Illinois, and both the men's baseball and women's softball teams have been playing their southern trip games for the better part of a month now. The baseball team is off to a 6-7 record, but that includes 2 wins over nationally ranked Florida. The Illini are scheduled to take on Southern Illinois this weekend at the new Itch Jones Stadium, but weather may force the cancellation of those games. The Illini host Indiana State next Tuesday in a game that the weather could also factor into. Oh the joys of living and playing in Illinois in March. The softball team is off to a surprisingly fast start this season at 12-6, after an 8-0 start. They haven't played as well lately, but that doesn't mean that they aren't slacking off. The Illini are set to host the Illini Classic this weekend at Eichelberger Field, a tournament that includes St. Louis, North Dakota State, Omaha and Western Michigan. There will be four games on both Friday and Saturday, before the Illini open up Big Ten play next weekend against Iowa. Finally, a special shout out goes to Illini wrestler Jesse Delgado, who won the Big Ten title at the 125 pound weight class last weekend at the Big Ten Championships in Madison, Wisconsin. Delgado, by virtue of his title, received the #1 seed in the upcoming NCAA Championships to be held next weekend in Oklahoma City, Oklahoma. Besides Delgado, the Illini qualified 7 other wrestlers into the NCAA's, Those being as follows: Zane Richards (133), Steven Rodrigues (141), Zac Brunson (157), Jackson Morse (165), Tony Dallago (174), Nikko Reyes (184) and Mario Gonzalez (197). Beware folks, because this Fighting Illini men's basketball season just got a bit more interesting. Left pretty much for dead 3 weeks ago, head coach John Groce decided to shake up his starting lineup, and the results have been astonishing at best. Freshmen Kendrick Nunn and Malcolm Hill were inserted into the lineup 6 games ago, and during that stretch of games, the Illini have gone 4-2, including the last 3 in a row being wins. A winning streak is the last thing that this team would have expected given the rough road that they have faced in the Big Ten season this year. But, the defense has stepped up in a huge way, holding their opponents to under 50 points in the last 3 games, something that hasn't happened since 1947. The latest takedown: #18 Michigan State on Saturday in East Lansing, a 53-46 win that has once again given life to the Illini's postseason hopes, and has also breathed a bit of optimism into Illini Nation. Dare to dream? Why not! After all, the Illini are playing some of their best basketball in this latest stretch, and the addition of Nunn and Hill to the starting lineup has given the team new life. Not to discount the players that they replaces, Joseph Bertrand and Jon Ekey, who are beginning to play a little better and are accepting their new roles as best as they can. Bertrand was in a funk mid-season, and the steady shooting of Ekey has come back a little bit after going by the wayside earlier. Illinois (17-12 overall, 6-10 Big Ten) looks like a totally different team as of late, and the thoughts are there that if they win out in the regular season and maybe steal one or two in the Big Ten Tournament, they could still get an at-large berth in the NCAA Tournament. But before I get accused of drinking the orange and blue kool-aid, there still is a lot of work to do in order for that scenario to happen. First of all, they need to win on Senior Night at the State Farm Center on Tuesday night against Michigan (6:00 pm CT, ESPN), then win yet another road game on Saturday at Iowa. Then, and only then, they can worry about winning enough games in the Big Ten Tournament to boost the resume. Speaking of the tourney, this year's edition should be one of the more balanced ones yet, and the possibility is definitely there of any team running the table and capturing the automatic bid to the big dance. Yes, that includes Illinois, who is now perceived as a dangerous team with all of their recent success. Whatever happens these final 2 weeks, it has given plenty of optimism for the rest of this season, and especially into next year. As far as things go on the women's side, the picture is not nearly as rosy, quite the opposite in fact. Matt Bollant's team has limped into the postseason, losing their last 10 games, and not winning since January 23rd, the Illini ladies finished dead last in the Big Ten, and hosted Senior Day on Sunday afternoon at the State Farm Center in Champaign. A couple of positives can be taken out of the loss to Iowa. First of all, they only honored one senior, Amber Moore, meaning that the rest of the team will remain intact for next season. Second, Ivory Crawford scored her 1000th point in the game against the Hawkeyes, which is an impressive feat for anyone. The Illini lost the game to Iowa 81-56, and finish the regular season with a dismal 9-20 overall record and a mark of just 2-14 in conference play. For this, the Illini received the 12th seed in the Big Ten Tournament, which begins Thursday at Bankers Life Fieldhouse in Indianapolis, and will play on Thursday against #5 seed Iowa at approximately 1:30 pm central time. The Illini should know the Hawkeyes' tendencies well, since they just played them. It certainly hasn't been easy for Bollant this season, and I am sure that he did not expect this when he took the job and left Wisconsin-Green Bay, where he was virtually unbeatable. Hopefully Bollanr can catch lightning in a bottle and make a run in the Big Ten Tourney, but given the way things have gone for them this season, that seems very unlikely at this point. Spring football is officially here, with practice beginning on Wednesday, and this promises to be a big year for coach Tim Beckman, who begins his third season at the helm of the Illini program. It is also a make-or-break year for him, since the program needs some success in order for him to continue. Athletic director Mike Thomas has made it clear that he wants to see the Illini programs compete for Big Ten titles, and he has given Beckman time to formulate his staff in order to get that done. That makes 2014 a pivotal year for Beckman and his staff, and wins, not to mention a bowl bid, will go a long way in keeping them in Champaign beyond next season. The Illini will hold 2 practices that will be open to the public, with the spring game being set for Saturday, April 12th at 2:00 pm. An updated practice schedule can be found by going to www.fightingillini.com and clicking on the football link. Maybe these freshmen can play after all. Faced with a must win situation last Sunday in State College, Pennsylvania, Fighting Illini head coach John Groce decided to shake up his starting lineup, one that he had used the entire season to date. That lineup included two freshmen, Kendrick Nunn and Malcolm Hill, players that had been consistent as of late, and piqued Groce's attention. With the Illini on an eight game losing streak and losing momentum fast, Groce felt the time was right for the change. What followed was pure genius, as Illinois prevailed, defeating the Penn State Nittany Lions 60-55, ending the losing streak and breathing some signs of life back into the program. Nunn had a career high 19 points, while Hill was the only other Illini player in double figures with 11/ Nunn had been playing better as of late, while Hill has been steady for most of the season. All 10 players that saw action played double figure minutes, something Groce wants to do more of, provided that the players respond. "It's up to the players to make that decision", Groce said on Tuesday in a teleconference recapping the win over Penn State. Groce continued by saying that "I hope they (Hill and Nunn) aren't one-hit wonders. I've listened to a lot of 80's music over the past few days, and there are a lot of one-hit wonders in there, and I hope that Malcolm and Kendrick can build upon their performance". Seldom used Austin Colbert put forth a good effort, as did fellow freshman Maverick Morgan in spelling Nnanna Egwu, who only played 2 minutes in the first half due to being in foul trouble. The Illini (14-10, 3-8), now will head to the other side of the conference border Wednesday evening when they take on the Nebraska Cornhuskers at their new home, Pinnacle Bank Arena in Lincoln (8:00 pm CT, BTN). Nebraska is currently 12-10 overall and 4-6 in the conference standings, but have only lost once at home this season. The Cornhuskers are having a resurgence of sorts under second year coach Tim Miles, one of the more colorful coaches in the league. Nebraska has three transfers that see plenty of action, Terran Petteway, Walter Pitchford and Leslee Smith. Nebraska has defeated Ohio State and Indiana at home, and their only loss in Lincoln came against Michigan, and that was by a single point. Bottom line is, this is a much different Nebraska team, one that is capable of beating anybody on any given night. For the Illini to get a winning streak going, they will need to do more of what they did against Penn State, and the freshmen will once again have to step up and play like veterans. Second year women's coach Matt Bollant is having a difficult time stringing wins together, and at times, it can get downright frustrating. The Illini lost for the 6th time in 7 games 66-61 last Sunday to Minnesota at Williams Arena in Minneapolis, and as a result, dropped them to 2-9 in the conference standings and 9-15 overall, something Bollant is not used to. While he was at Wisconsin-Green Bay, he won consistently, and it appears that it may take a bit longer to turn the Illinois program around. The Illini program has been down in recent years, and while Bollant is bringing some talented recruits into the fold, the results are just not there right now. To make matters worse, Mackenzie Piper announced that she is leaving the program, effective immediately. The Illini will get another chance to break the losing streak on Thursday night when they travel to Iowa City to battle the Iowa Hawkeyes (8:00 pm CT, BTN). With Fighting Illini football on the horizon, they are scheduled to begin practice early next month, including a couple of off-campus appearances. The Illini will travel to Chicago to conduct a practice at Gately Stadium on Friday, March 14th, while also making a trip to Springfield to practice at Sacred Heart-Griffin High School on Friday, April 4th, Both practices will begin at 5:30 pm. The full spring practice schedule can be found by visiting www.fightingillini.com and clicking on the football link.